Use a custom text instead of Change value as title in the Change value dialog for the Numeric variable object. The next version of Odrid HMI will have a sligthly smaller workspace on iPad devices than previous versions. This is due to changes in iOS, the Navigation Bar is 6 dp higher in iOS 12 than in earlier version of iOS. 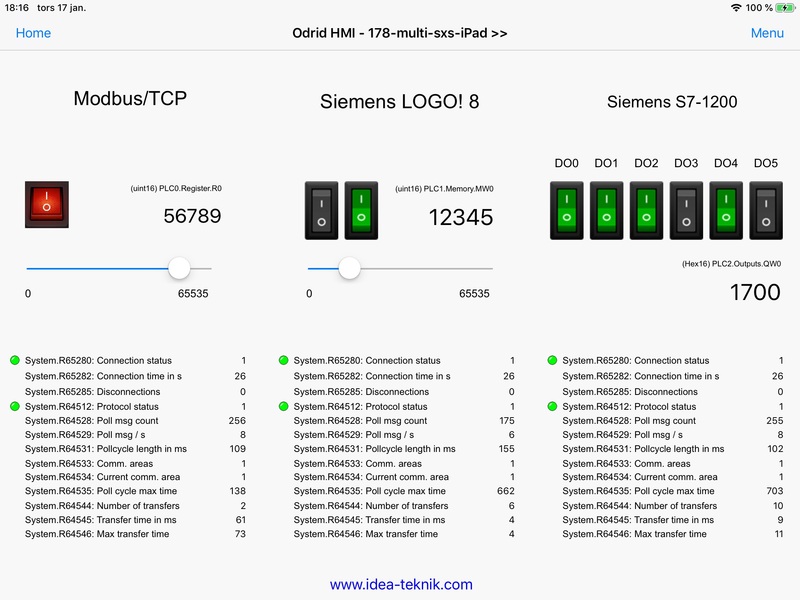 2019-01-18: Odrid HMI on iPad connected to 3 PLCs concurrently. Screnshot of Odrid HMI 1.3.7 (Beta) on iPad (2018) with iOS 12.1.2. 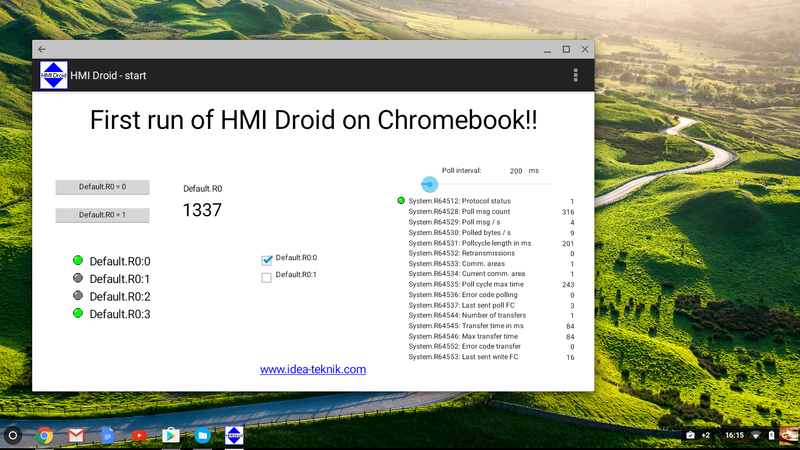 2019-01-15: Odrid HMI 1.3.7 now in Open Beta test !! HMI Droid on a Raspberry Pi 3 B+ using emteria.OS and a 7 inch multi touch screen. 2018-12-30: Odrid HMI 1.3.4 now in Open Beta test !! Update: Released as production version 2019-01-03. 2018-12-23: Odrid HMI 1.3.3 now in Open Beta test !! 2018-12-19: Odrid HMI 1.3.2 now in Open Beta test !! One user have reported that the menu button does not work in Odrid HMI 1.3.1 on iPad (6:th generation) with iOS 12.1.1. The app works very robust. There is no cloud service that could fail. Therefore the app can also be used in security sensitive use cases. We could create two small control panels in few hours without any previous knowledge of HMI. Great ! 2018-11-06: Odrid HMI 1.3.0 now in Open Beta test !! 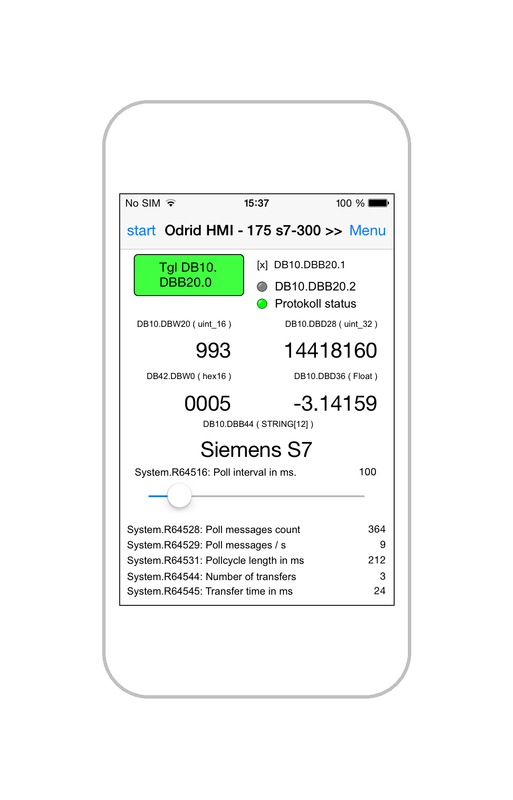 The first successful test run on an Iphone 5s, connected to a Modbus/TCP slave and to a Siemens LOGO! 0BA8 PLC simultaneously. Now you can participate in the public Beta test by using this link. 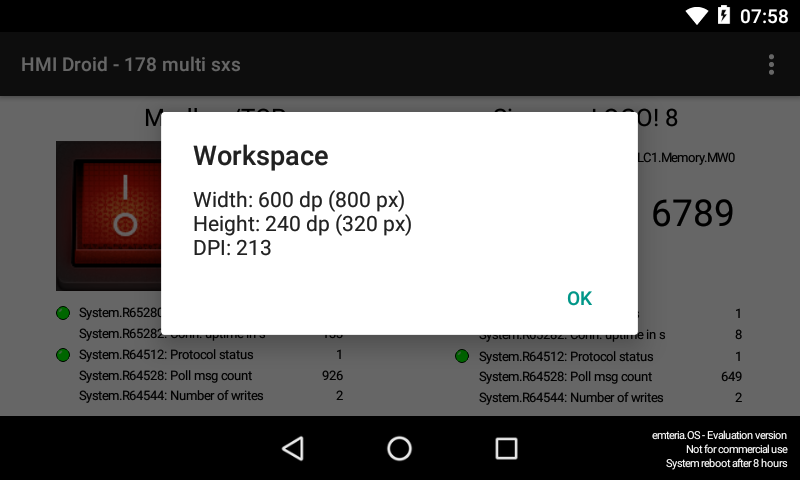 HMI Droid 1.7.8.89 connected to multiple PLCs in the same panel (page). This upcoming version will support up to 8 simultaneous connections or "channels". 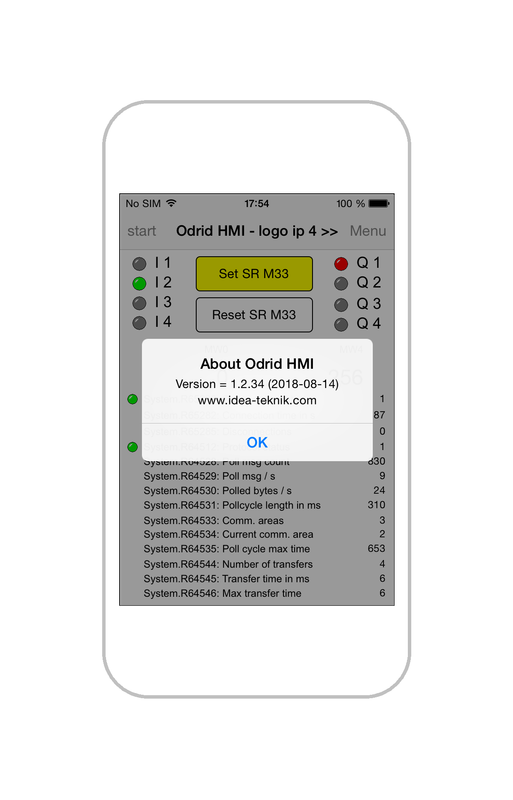 This version of Odrid HMI is built for iOS 11.4. 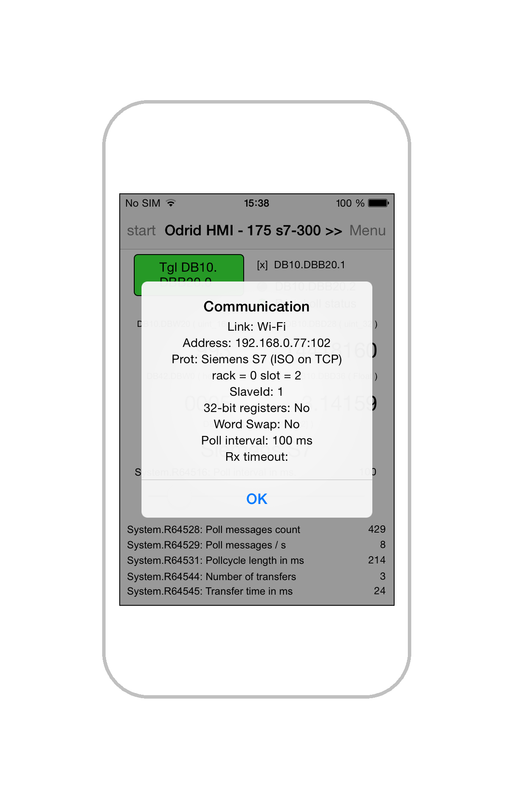 Due to technical reasons, we are currently not able to publish any updates of the iOS-version of the HMI/SCADA app Odrid HMI. The version 1.2.33 published 2018-04-11, should currently be considered as the last version. We are trying to solve this problem. We suggest that you use the Android version of the app instead if possible. If you have purchased the iOS-version of the app before 2018-08-15, you can request a code for downloading the Android-version free on Google Play. 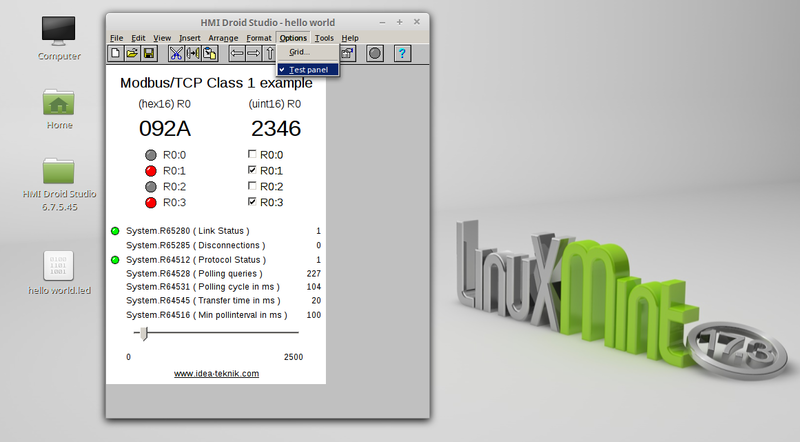 Alpha version of HMI Droid running on Linux Mint 18.1 Xfce with live Modbus/TCP communication. We have received some reports of Out Of Memory Error on a Samsung Galaxy Grand Prime (grandprimevelte), 1024MB RAM, Android 5.1 when using image objects or image buttons. We are keen to solve the problem. If you own this device, please contact us at support@idea-teknik.com. 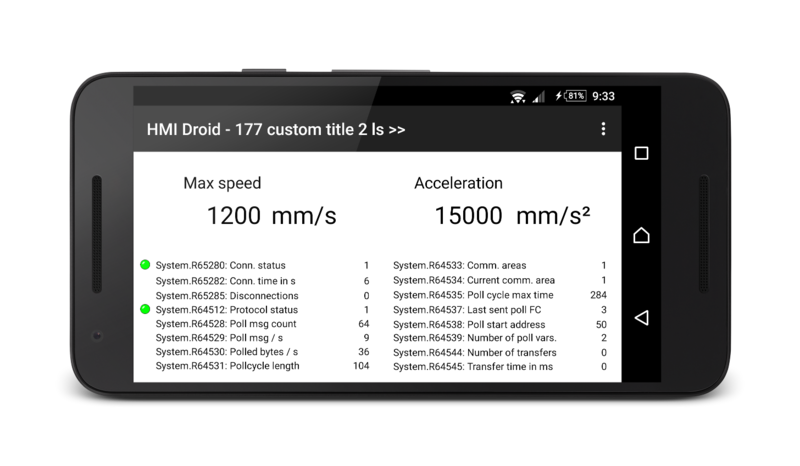 Upcoming Linux version of HMI Droid for e.g. PC or Raspberry Pi. HMI Droid Studio can now be downloaded on Microsoft Store at a low cost. This version does not have the 15 minutes time limit for the test run panel (page) feature. HMI Droid Studio will soon be available in the Windows App Store to simplify download and installation. 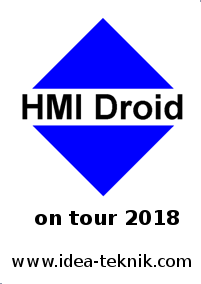 From Tuesday April 3 and about a week forward the HMI Droid will be on tour in Sweden and Germany. We would love to meet interested customers and potential users on our journey. Take the opportunity to discuss your solutions, reflections and questions directly in real life. Send us an e-mail if you want to make sure to meet us. 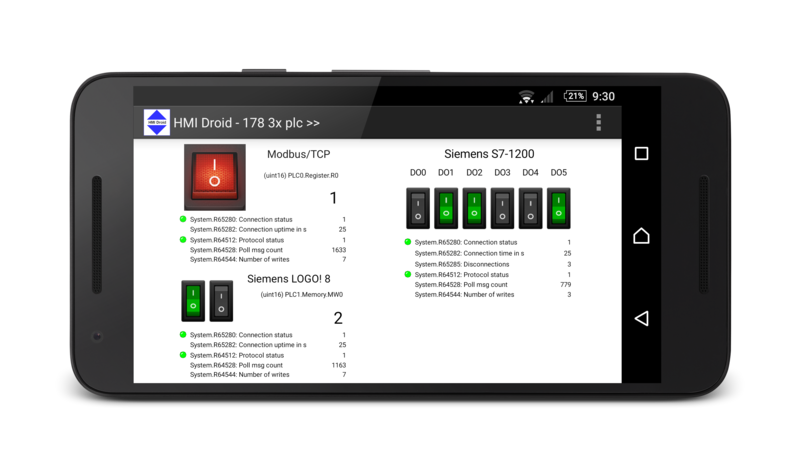 Many customers are using HMI Droid (Android and iOS) with Siemens S7-1200/1500. A few settings are required in TIA Portal to make it work. See this section in the FAQ for details. We get reports about occasional crashes and ANR (App-Not-Responding) errors from some Android devices using old versions of HMI Droid. E.g. a Lenovo Vibe P1 (P1a42) with Android 6.0 and version V1.7.5.72 of HMI Droid. The crash can occur when tapping a Button very fast and multiple times, but the write operation to the PLC fails. Please update this device with the latest version of HMI Droid to eliminate these problems. 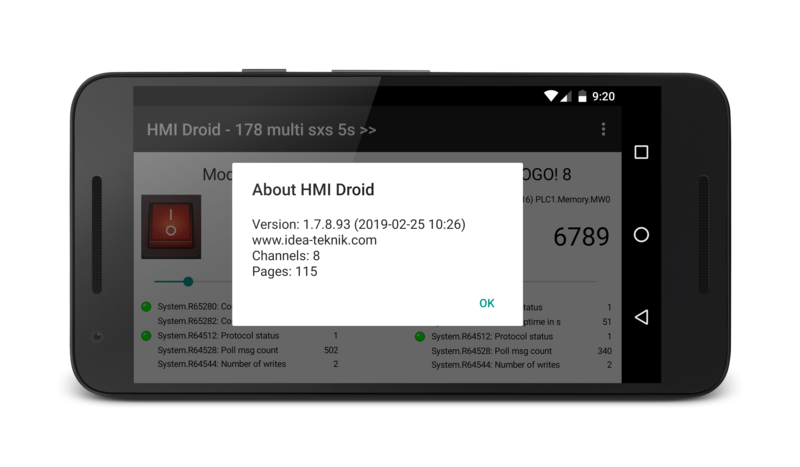 Version 6.7.6.1061 of HMI Droid Studio is available in the download area. The next major release of HMI Droid Studio will add more color options to the Button object. 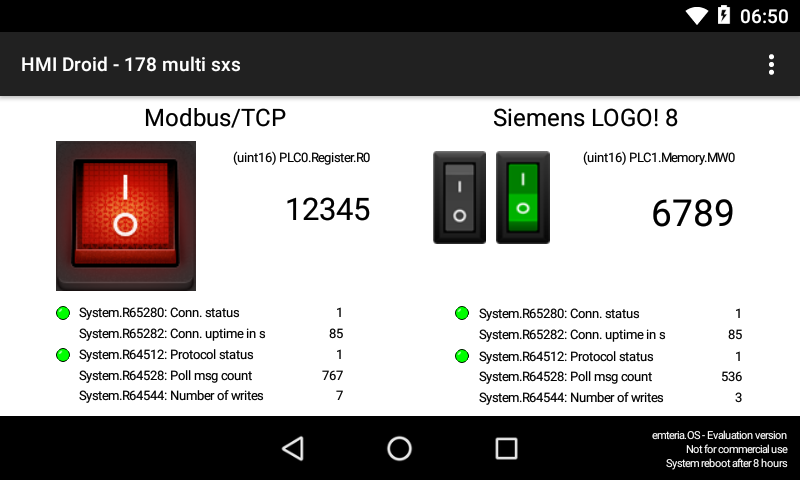 Support for Siemens S7 Communication in the Test panel mode of HMI Droid Studio simplifies the development of panels (pages) for the Siemens S7-300, 1200, 1500 and LOGO! 8 controllers. Watch short demo on YouTube. Please contact info@idea-teknik.com if you would like to participate in the Beta-test. Watch short clip on YouTube. A LOGO! Soft Comfort project with settings for HMI Droid can be downloaded here as Circuit Diagram1 - HMI Droid.lsc. 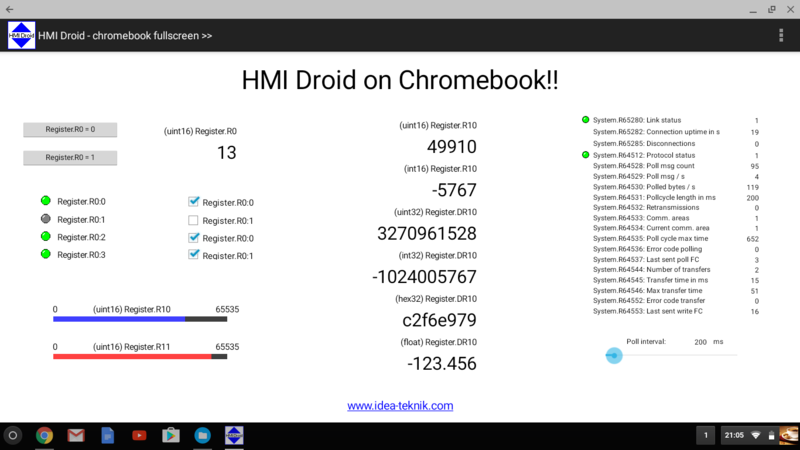 Use same HMI on Android, iOS and Windows. There has been some crashes on (11/4,) 20/4, 21/4 and 4/5. The most crashes has occured on iPhones (iOS 9.3?) and with version 1.0.3 of the app. We have found that invalid settings for communication e.g. WiFi ( = tcp/ip ) selected but port number left blank can sometimes cause a crash. Beta version of 1.7.4 available. Settings for S7 Rack and Slot stored in the panel files. Please contact us by mail for instructions how to download the Beta-version. Please contact us by mail for more information. HMI Droid V1.7.2.59 released with support for the Siemens S7-1200 and S7-1500 controllers. This version might work with Siemens LOGO! too. 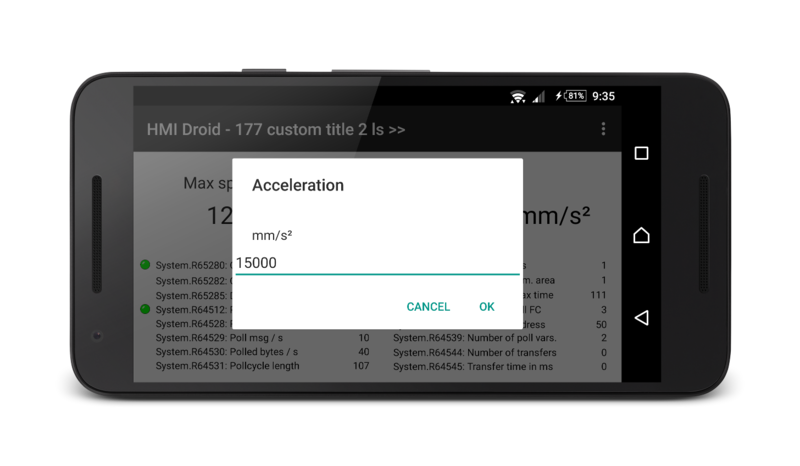 HMI Droid is now available at amazon appstore for the Android and Kindle platforms. Amazon, Kindle, Echo, Alexa, Dash, Fire and all related logos are trademarks of Amazon.com, Inc. or its affiliates.